We are very excited to offer shares in the Love Conquers All (Mossman) x Snitzel Express (Snitzel) filly purchased for a very reasonable $30,000 at the recent Magic Millions March Sale. The filly is bred on the same cross as Group 1 Golden Slipper Winner MOSSFUN (Mossman/Snitzel). Her dam Snitzel Express was sadly unraced due to a cyst on her stifle. Her first foal a colt, by Spirit of Boom, although very tiny (reportedly to be under 15hh) has shown plenty of courage and speed having already won and placed from his first three starts. This filly is her second foal and she is well grown and a very strong type. Knowledgeable thoroughbred racing enthusiasts will tell you to buy the progeny of unraced mare out of a champion mare. Snitzel Express’s dam Express Air was a winner of the Group 2 Queensland Guineas and multiple stakes placed. The Queensland Guineas is a classic 3YO race run over 1600m during the Queensland Winter Carnival. Her sire Love Conquers All (Mossman x She’s A Meanie) was a tough multiple Group winner of 8 races with 7 Group placings and amassed career earnings of $1,380,000. He is the sire of Group 2 winner Savanna Amour and Group 3 winner and MM QTIS winner I’m A Rippa (winner of nearly $1.2M). 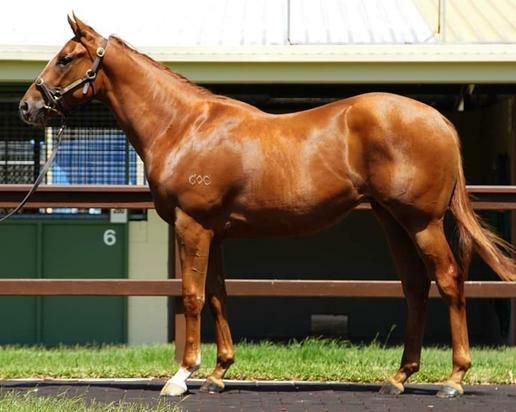 The filly looks to be a precocious 2YO type and as she is both Magic Millions Race Series and QTIS Fillies Bonus eligible.